A full chorus line compacted into one box. Versatile chorus sounds. Great in stereo. 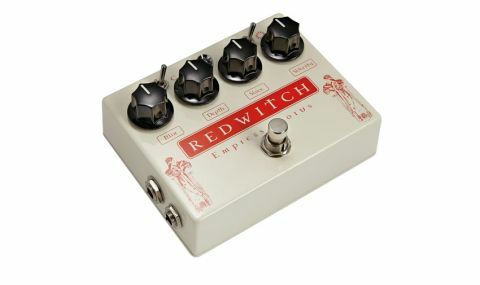 Unlike most chorus pedals, the Empress has a (voice) knob to adjust the delay time, allowing, says New Zealand-based manufacturer Red Witch, "an infinite number of analogue chorus pedals in one box". "You can choose between vibrato and chorus modes, with the former yielding vintage vibe sounds"
Modulation depth and speed (velocity knob) are adjustable, as is the wet/dry blend via the mix control. You can choose between vibrato and chorus modes, with the former yielding vintage vibe sounds, plus a neat line in rotary speakers, but it's the chorus that's special - sparkly, spacious and varied. Early Boss units are the benchmarks here, and next to vintage CE-1 and CE-2 units the Empress lacks some of their warmth, with more of a 'modern' treble content, but is able to replicate the range of chorus available and then some. It's especially good when hooked up in stereo - like mic'ing a JC-120's speakers separately and panning them. No wonder Andy Summers uses one. Great sound and versatility make this one of the best chorus pedals around.